I love this coin! Esthetically it’s one of my favorite ones, and this all has to do with the seal – doing what seals do – relaxing on some rocks. This is a one of few freshwater seals and it’s called a Saimaa ringed seal which, unfortunately, is an endangered species. I especially like its whiskers. On the other side you have some lily pads and also a dragonfly. As I mentioned in an earlier post Finland is very closely connected to Sweden. Close to 300 000 people in Finland speaks Swedish as a native language and Swedish language is a mandatory subject in Finnish schools. 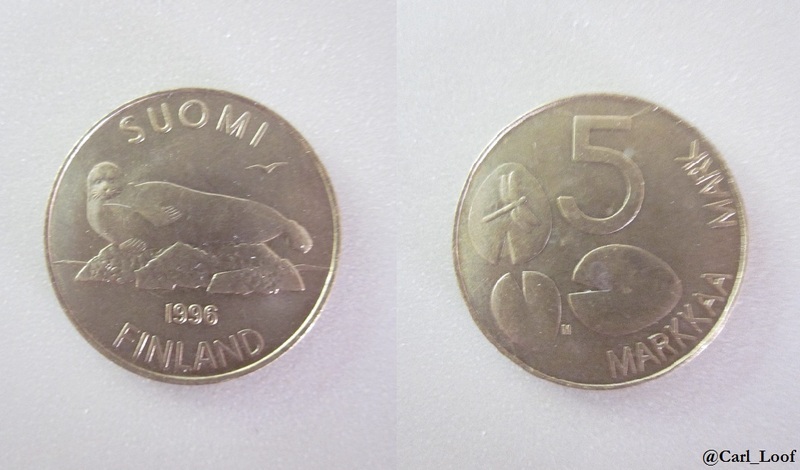 In recent years an opposition to the Swedish language has gained power, but as we see on this coin from 1996 the bilingualism of Finland is of importance. The Finnish markka was replaced by the euro in 2002. This coin is quite common in circulation here in Sweden. It’s the latest coin minted in Sweden (apart from the silver/gold “wedding coins” from 2010). 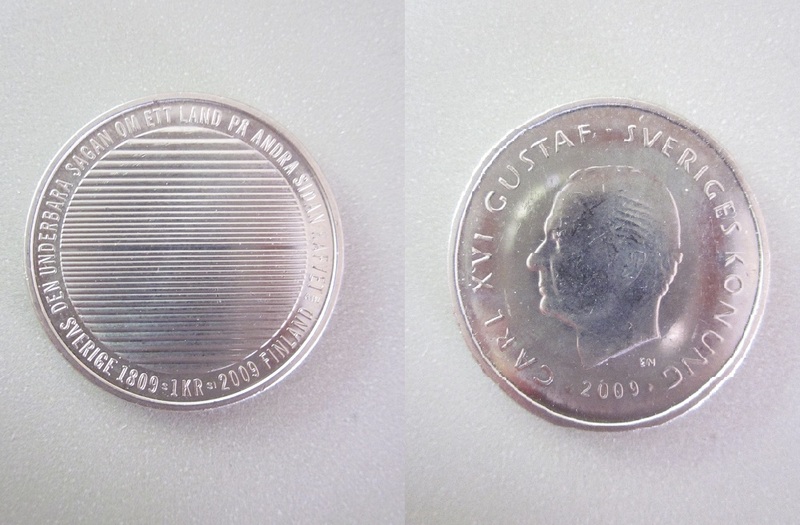 This coin features King Carl XIV Gustaf of Sweden just like the normal 1 krona, but the other side is different. In 2009 it was 200 years since Sweden got separated from Finland and it is this that the coin commemorates. Finland was basically a part of the Swedish kingdom from the 13th century throughout the days of the grand Swedish empire until 1809 marking the definite end of Sweden’s days as a greater power in Europe. Finland was lost to the archenemy, Russia, and it was a huge defeat. This was not like losing a distant colony; this was a part of the motherland which was taken away – causing a huge political crisis in Sweden. From a Finnish perspective the separation was both negative and positive. Culturally the Finnish people were more connected with Sweden (a lot of them spoke Swedish as their native language). However, Finland would get the status as an autonomic grand duchy within the Russian empire thus taking one step towards independence. This coin is not commemorating the separation as something regretful; instead it salutes the friendship shared between the two countries since the separation. The text on the reverse side translates into “The wonderful tale of a country on the other side of the ocean” and the stripes symbolize the sea and the sky between Sweden and Finland. The text is from Anton Rosell’s book Studiebesök i Finland from 1857. It’s a beautiful coin in both design and symbolism.